We have felt the atmosphere of Autumn after mid of august in here Norikura kogen. Today, We’d like to inform the peak of Autumn color. Alpine（More than 2500m) Peak:The end of Sept 〜 The beginning of Oct.
We recommend to come the beginning of Oct.
You can enjoy the autumn color and hiking in Alpine area to sub-alpine area at the same time. It is so beautiful every year. The peak might be changed due to weather. Please book the room through official web page. 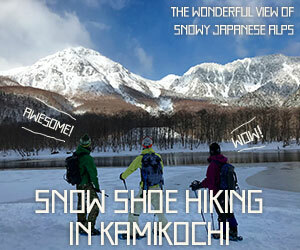 Guesthouse Raicho Snowshoeing tour now in progress!